The 2001 remake of “Planet of the Apes” was supposed to be a jumpstart to a second series and more sequels were supposed to be made. However, that film turned out to be such a critical disaster that all other sequels were canceled. But 20th Century Fox still saw a lot of profit in the franchise and decided to reboot it in a completely new faction. The end result is the 2011 movie titled “Rise of the Planet of the Apes” and it’s easily one of the best films in the entire series, in fact I’d go so far as to say that it’s one of the best Sci-Fi’s to be released in years. Unlike its 2001 predecessor, “Rise of the Planet of the Apes” is a much smarter film that doesn’t really on cheep B movie charms or lots of action scenes, in fact there’s hardly any action in the movie at all until the climax. The film also serves as an effective warning story about the dangers of science and how a medical breakthrough may seem like mankind’s greatest accomplishment, when in reality it becomes our downfall. The story goes like this, James Franco plays a scientist named William Rodman, who believes to have discovered a cure for Alzheimer’s. He tests his drug on a female ape that was with child, the mother was tragically killed but the effects of the drug pass on to the infant, which Dr. William takes in his care and names him Caesar. 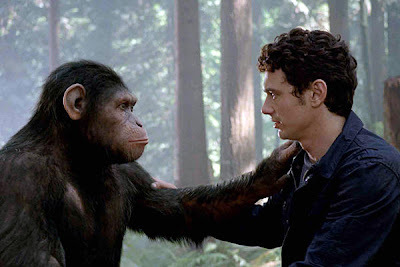 The two form a strong friendship but after an unfortunate accident, Caesar is taken to an animal control center where he’s locked away with other apes. After spending some time there, Caesar becomes a leader amongst them, gives them the same brain drugs given to his mother and leads them in a rebellion. It’s almost like a remake of “Conquest of the Planet of the apes”, right down to the ape Caesar being the ape character who leads his fellow apes in a rebellion against human kind. However there are some significant changes in this film that makes it stand well on its own, in fact this movie doesn’t even feel like its part of the same franchise. Everything feels so different and so expertly crafted that you’d almost swear it’s from another series entirely. 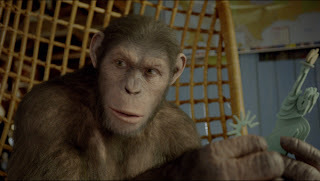 The apes in this movie don’t even talk, with the exception of Caesar who briefly speaks. Even though this is a much smarter movie then many of the previous installments, it still has one factor that might seem a little too gimmicky for some. Just like with the 2001 remake, this film constantly makes reference to the original film, which I honestly think is pretty cool but it can be distracting for other people. 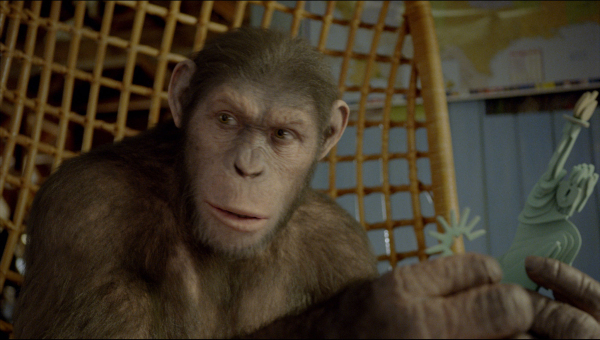 One of the chimps being tested on is called “Bright Eyes”, which is what the apes called Taylor in the first film. There’s one scene when Caesar is building a model of the statue of liberty, an obvious nod to the famous statue of Liberty ending of from the original. 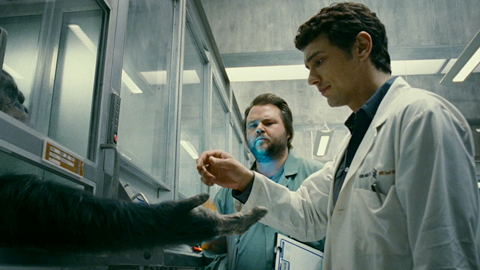 Some of the games that the apes are tested with in the labs are very similar to the intelligence games seen in “Escape from the Planet of the Apes”. There’s an orangutan who’s named Maurice, which is a nice little nod to the actor Maurice Evans who played the evil orangutan from the 1968 classic. Actually, many of the apes in this film are named after characters or actors from the original series. There’s this one bully character played by Tom Felton (Draco Malfoy from the Harry Potter series) who constantly quotes Charlton Hesston’s classic lines, including a moment when he’s spraying all the apes in their cell’s with a water gun while shouting “It’s a mad house, a mad house!” and naturally, he has to quote the most famous line of them all “Get your filthy paws off of me, you damn dirty ape!” Heck, even his first and last name, Dodge Landon is a reference to the two other astronauts from the first film. Now with all of these little references and inside jokes, this movie could have easily been just another campy installment in the series that’s just one big love letter to the original but through some competent writing that focuses more on characters and more importantly on substance, this film succeeded it’s small expectations and can be viewed as a genuinely good film. First of all, I love the scientific aspects of this film and the example of how dangerous it can be. While the movie doesn’t quiet dive into the realms of really deep or thought provoking questions, it dose at least bring up some important issues. How far should we go to try and perfect something that was never meant to be in our control, can we handle that responsibility, is this human progress or are we just opening Pandora’s Box. Its issues like this that elevate this movie above just another campy Sci-Fi, and my favorite aspect about this film by far is it’s completely different perspective of the wild animal on the loose franchise. In most animal attack movies, the wild animal is always the monster that needs to be killed in order for the humans to live, but in this film, it’s not so one-sided. 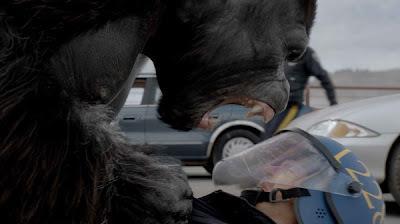 Despite what you may think from seeing the trailer, the apes don’t try to dominate humans, there goal is simply to liberate themselves from the captivity of human kind. In fact they try their best not to kill anyone, they only kill in self defense and even in that respect there’s nothing pleasant about it. There’s a moment when Caesar defends himself against the bully character, which unintentionally takes his life and you can tell from the reaction on Caesar’s face that it really hurt him deep down to take a life. As an interesting result, you find yourself cheering for the apes. Even though you naturally don’t want to see the humans trampled underfoot, this film really gets you to care for the ape characters, and it just hurts you to see them getting beaten with bats and clubs. The performances in this film are all very good, James Franco delivers a genuine and honest performance as the good doctor and the remaining cast all play their parts quiet well. But the star who completely steals the show surprisingly isn’t one of human actors, instead it’s CGI actor Andy Serkis in the role of the ape Caesar who keeps you completely captivated throughout the entire picture. Now a CGI actor is a performer who wears a blue suit that computer generated effects will cover up later, almost like giving an actor makeup that’s not physical makeup. Andy Serkis is no stranger to this craft and has played all kinds of memorable CGI characters including Golem from “The Lord of the Rings” trilogy and is also known for playing King Kong in the 2005 remake. Now it may seem strange to give so much credit to an actor that’s basically one big special effect but so much character and personality come from his simple body movements and posturing that it feels like a genuinely human performance, in fact many people suggested that he be the first CGI actor in history to be nominated for the best actor award. 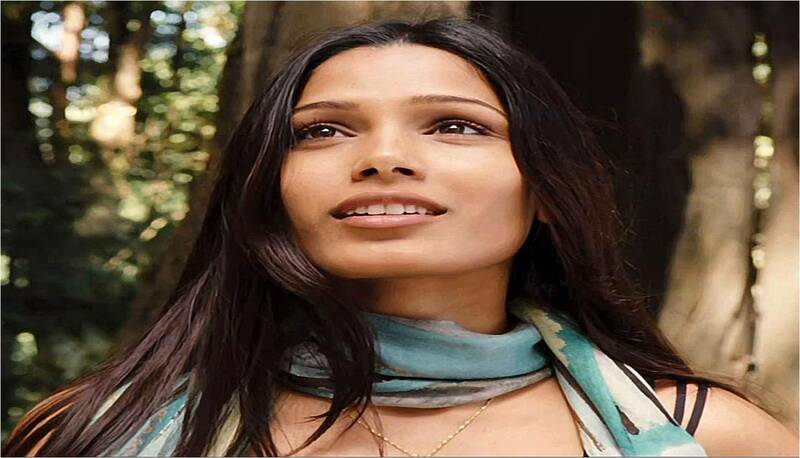 Most of the remaining apes in the film are played by other talented CGI actors and it’s a unique change from the makeup that where so accustomed to seeing in these films. I was a little skeptical going in because I always prefer makeup or puppets and I didn’t think I’d get that much realism from a bunch of CGI apes. To my surprise, they looked really good for the most part and I actually began to forget that they were CG creatures. There are some obvious CGI moments like when we see Caesar as an infant but the fully grown Caesar looked very believable, as did many other shots involving herds of apes. The action in this film isn’t jaw dropping but the movie draws you in so well that everything feels really big. The passing of this film is especially good, nothing feels rushed and it certainly isn’t boring. Just like the original movie, not much is happening on the face of this film, in fact the apes don’t even make their big escape until the tail end of the film. But the characters, story and tone hold your attention so well that you don’t even pay attention to the films lack of big specials. That’s not to say the film doesn’t have its power house moments, the climax on the Golden Gate Bridge is riveting and will certainly please anyone wanting some action. 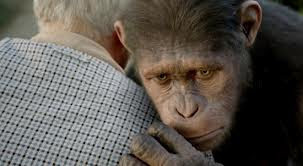 My only complaint was the way the film ended, there was so much build up as to what was going to happen in the end, but then the apes all reach their destination in the woods and the movie just seems to stop. It’s like, "What the heck", you’re stopping it right when things got really intense and interesting? We also reach a plot point that some tock-sick gas got loose from the lab and have begun to infect humans across the globe. The apes are immune to it, so this naturally sets the stage for them to become the dominate species on the planet without the need to go into battle. Overall, this was a very good movie that took an old, deflated franchise and gave it new life again. Most people would still call the original the absolute best, but personally, I think this this one is better. Rupert Wyatt’s direction is just so precise, stylish and everything else just feels so professionally handled. More than anything, I love that while this film has its share of impressive special effects, this doesn’t feel like a big special effects picture, it feels like a genuinely good film, with characters that hold your attention and a story that keeps you guising what the outcome might be. It’s the kind of film that I hope Hollywood would make more of, something that doesn’t go straight for non-stop action and visual effects. Now the movie isn’t a landmark masteries or anything like that, but it is still very well constructed, delivers a rich warning on the dangers of science and offers an interesting new perspective regarding the wild animal on the loose franchise. 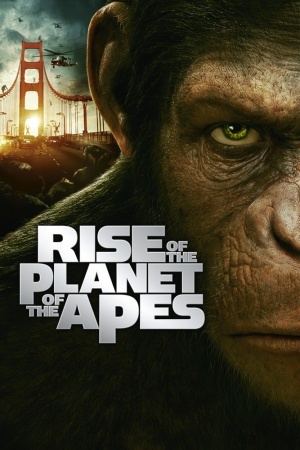 I give “Rise of the Planet of the Apes” 4 stars.